These two besties will find their way straight to your heart and win it over! Take a look at this latest machine embroidery design we’ve just released. 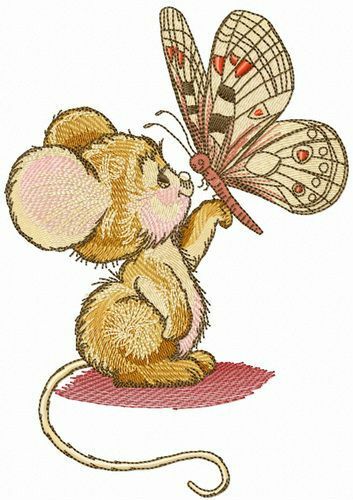 It features an adorable beige mousekin and a colorful butterfly that’s landed on the mousekin’s paw for a friendly chat. The wings of the butterfly come decorated with a beautiful geometric pattern. The color palette in this design is a pastel combination of auburn, mountain rose, saffron, sand dune, almond and coral. This is going to be a gorgeous addition to things like towels, tablecloths, napkins, cushions, pajamas, toys, T-shirts, sweaters and more.